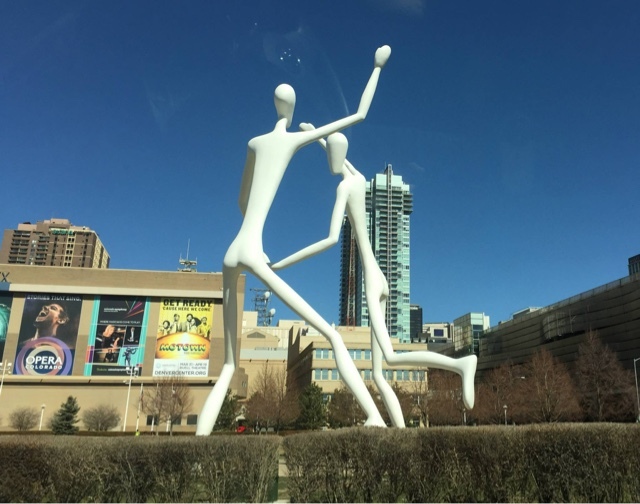 If you happen to visit downtown Denver, you sure don't want to miss these two ginormous dancing sculptures outside the Denver Center for the Performing Arts in Colorado. These two statues are made out of steel and fiberglass. Pretty cool right?! "Dancers was permanently installed in front of the Denver Performing Arts Complex on June 12, 2003. It is a 25-ton steel and fiberglass sculpture. Mounted around the circular base of the sculpture (at ground level) are 5 speakers, which continuously play the song "Let's Dance". "Let's Dance" was composed, performed and recorded by Jonathan Borofsky and Samuel Conlogue at Infusion Studios in Portland, Maine. The sculpture was commissioned by the people of the City and County of Denver, in conjunction with the Mayor's Commission on Art, Culture, and Film, and the Denver Art, Culture and Film Foundation."